For buy it now is a Lexicon MC-12B Balanced Audio Outputs THX Logic 7 Surround Sound Processor. Unit has firmware version 5.25 loaded. Unit was installed into a rack and left, until it was recently removed during an upgrade. Trending at $1,150.00eBay determines this price through a machine learned model of the product's sale prices within the last 90 days. This looks great and works perfect. Actual photos. Includes antennas and power cable. Plenty of clean power - 110 watts RMS per Channel into 8 ohms; two channels Driven, 20 Hz to 20 kHz, < 0.1% THD (80 watts RMS per Channel, all channels Driven). NAD M15 Surround Sound Pre-Amp. Condition is Used. Comes with manuels, both remote controls, power cord & Original Factory shipping box. Amp has almost no visible wear & is very good condition. Shipped with FedEx Ground or FedEx Home Delivery. Ships only to lower 48 states where FedEx delivers. SMSL M8 ES9018 24Bit/384KHz DSD DAC Optical Coaxial XMOS USB Asynchronous decode. Shipped with USPS Priority Mail. Krell Home Theater Standard 7.1 7 Channel Amplifier. Condition is Used. Removed from working home theater. No issues and in very good conditions. Lightly used. Comes with power cord. Inputs and outputs are aplenty on the Halo C2 and will just about handle anything except HDMI. Sonically, it is a great sounding unit. Running through the manual would be the ideal starting point of this exercise if you embark on it. Pre Tuner has been tested working onsite! Pre Tuner has wear from previous use including scuffs and scratches. Includes unit only. No power cable included. Quantity listing with reference photo, you may not receive the actual item pictured. Unit is on hand and ready to ship. Please feel free to message us any question you may have. Thank you for checking out our listing. .
B&K Reference 50 7 Channel Pre-Amp/Processor Amplifier with remote. I have a like new used condition BK Ref50 preamp processor for sale. Works great. Had it in my MiddleAtlantic rack system. Has a few small scuffs on top from sliding it in the rack. Hardly noticeable. 4.5 out of 5 stars - B&K Reference 50 7 Channel Pre-Amp/Processor Amplifier with remote. 8 product ratings8 product ratings - B&K Reference 50 7 Channel Pre-Amp/Processor Amplifier with remote. For sale is a Rotel pre-amp processor. Model: RSP-980 Please be aware this amp has the 220v European Plug. It does come with an adapter. Unit has been tested and powers on. Cosmetic condition of the amplifier is in perfect condition. There are no dents, stains or scratches anywhere. The amplifier was barely used and put away for several years. Comes with original box, remote, cables and user manual. Buy it now: $125.00 or best offer Shipping will be automatically calculated. McIntosh MX121 7 Channel Pre-Amp/Processor Amplifier. Condition is Used. Shipped with UPS Ground. AV600, Remote, Copy of Manual. It is in flawless working condition. The result is clear audible superiority. To keep potential confusion at bay, you can link a processing mode to a particular input so that, for example, selecting “CD” automatically invokes two channel operation while “DVD” calls up Dolby Digital as the default setting. The VSX-930 combines the latest connectivity and performance features and supports AirPlay, MHL, HTC Connect & DLNA audio networking. Connect your smartphone, tablet or laptop without hassle, either wired via LAN and USB or wireless via built-in Dual Band WiFi and Bluetooth. B&K REFERENCE 50 7 CHANNEL - PRE AMPLIFIER - CLEANED - TESTED. WORKS GREAT AND IN EXCELLENT CONDITION. Anthem PVA 7 , 7 channel amplifier, EXC. Rated at 105W into all 7 channels driven at 8ohms, 140W@4ohm and 2 ohm stable! Very quiet S/N 122db. This is a very nice sounding musical amp that Anthem got very right. is required. Local pick and inspection is free and CASH only when you do pick up. MADE IN ENGLAND / EU. 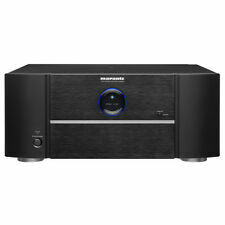 Marantz AV7701. Used in good condition. Tested and working. Remote not included. Serial number 66001321002476. Equipped with advanced processing and decoding technologies, the AV7701 Preamplifier lets you enjoy unparalleled audio performance regardless of the source. MYRYAD MDP 500 PREAMPLIFIER SURROUND SOUND PROCESSOR. This item has been tested and is in 100% operational condition. All channels are clean and clear with no hum, buzz, noise, or distortion. I tested both analog and digital sources using Comcast Xfinity cable box. The Krell Chorus 7200 is a 7-channel, 200 watts per channel (8 Ohm load) amplifier with Krell's iBias technology. iBias allows an am to run in Class A mode, while reducing energy consumption and heat output. Having said all this, could Sunfire's Amplifiers ever really provide you with too much power?. Just turn one up and find out. Sunfire TGA7201. If your item has already left the warehouse, we cannot match any reduced pricing. Number Of Channels 7. Price Match Policy. WE ARE HERE TO HELP WITH ANY AND ALL ISSUES. Must have a valid working phone number for all orders. One of the key characteristics of an AV pre/processor that we look out for, other than sound quality, is ease of use. There is almost nothing to fault on its sound quality. It actually sounded pretty good as a stereo only preamp too. We cater to music enthusiasts and audiophiles, and we love what we do. 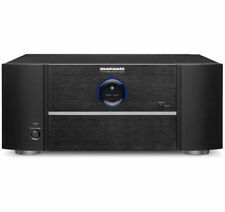 We design audio systems for all budgets, from entry-level to high-end. AMPLIFIER OUTPUT DETAILS. Channel Qty 7. Output Power 135 WPC. My B&K Reference 50 7 Channel Pre-Amp/Processor Amplifier is lightly used and is in Excellent condition. Yamaha DSP-A3090 7 Channel Pre-Amp/Processor Amplifier This item is functioning properly in every respect. It looks great and performs to perfection. B&K Reference 50 S2 Audio Video Processor. Marantz AV7701 Preamp Processor AV-7701 with remote. Condition is Used. Integra DTA 9.4 7channel Surround amplifier. produces 120watts @ 8ohm in surround mode. The Amazing Arcam FMJ AV-8. Four Wolfson 24bit, 192kHz capable, multi-bit delta sigma modulator DACs handle digital to analog conversion, giving outstanding audio quality and performance. Full system operation speed of 96KHz is available for linear PCM and Pro Logic II. Condition is Used. The item also includes the original owners manual complete with it's blue folder. Also in the box is the original power cord and RAA-1 Remote AM antenna and needed wiring. I also have the remote(no corrosion) and the stands(never used). Up for sale 9 months old Rotel RSP 1582 surround sound processor. Purchased from Magnolia and comes with all accessories. Upgrading to a Atmos processor as I have been bitten by the immersive sound bug. Please check my selling feedback and bid with confidence. Free shipping within US 48 states. I will ship to Canada but shipping will have to be paid by the buyer. Front speaker frequency response extends down to 50 or even 40 Hz; this is well within the frequency response of most subwoofers. This powerful 600 Watt amplifier is used in our strongest subwoofer, the MKVI. Great condition. Has two scuffs on the right side as seen in the photos. Works great! Integrated with 7 channel system, the BK Reference 50 amplifier has adequate ability to send information to a subwoofer, as well as seven diverse speakers. With 5 Hz - 45 kHz frequency response, this BK amplifier produces enhanced and loud audio output.